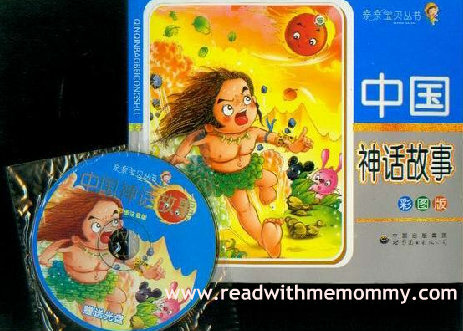 This is a very interesting storybook which puts together 32 famous Chinese legends. It comes with a free VCD. Your child can get to know many chinese legends, such as, the famous tale of the White Snake 白蛇传说, the legend of Chang-E flying to the moon 嫦娥蹦月, why Hou-Yi shot down the 9 suns 后羿射日, the 8 immortals crossing the sea 八仙过海, Jiang Tai Gong fish without a hook 姜太公钓鱼, the sad love story of Liang Shanbo & Zhu YingTai who eventually turned into two butterflies 梁山伯与祝英台, and many more. The book has 163 pages, with hanyu pinyin and is printed in simplified chinese. Soft cover. Each story is about 3-5 pages. For young children, parents can use this book as a resource for storytelling. For self read, this may be suitable for children of upper primary school levels.